How to access the C compiler? hello, how i can access the gcc in aros? Re: How to access the C compiler? okay, i have to install it first. but i have scrapped the result, and decided not to release it. 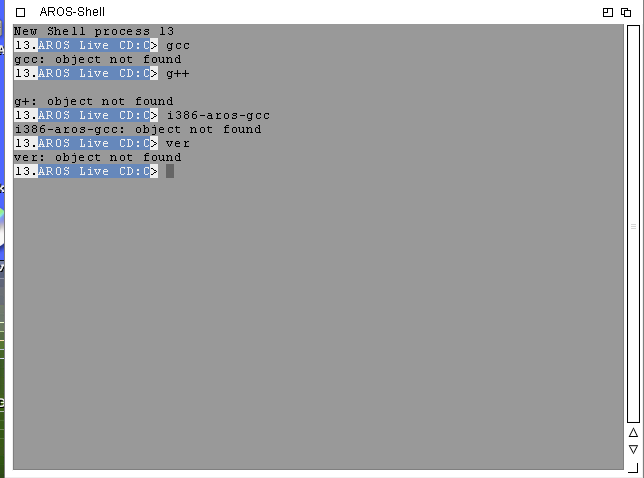 1. the gcc used in aros inserts every debug information (such as variable and function names) to the binary, and it canot be stripped. if someone disassembles it, essencially gets your source code. 2. no proper documentation. i was not even able to find an api call to get the number of cpu core count within 10 minutes of googling. 4. to counter to the 2th and 3th points, there is SDL. however, in aros, SDL1 was used, which is lgpl, therefore it is ILLEGAL to statically link it to a non-opensource software. SDL2 would be fine, but thats not available under aros. 5. no smp. smp was annouced a year ago or so, in theory it should work. but no, it does not works. 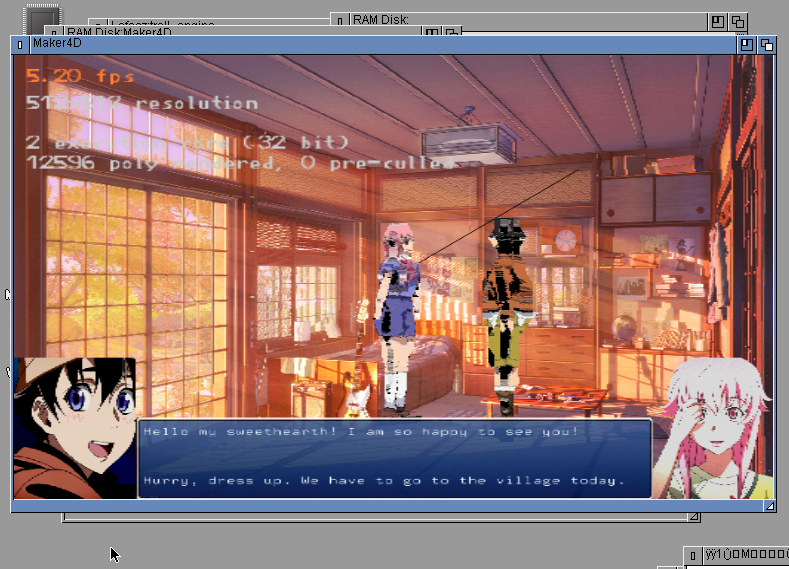 also, no sound (ac97) so i cant test if my program even have sound. Good luck, I believe someone will help you. Use the --strip-unneeded switch, which will only keep the symbols necessary for relocation. The "mainstream" ABIv0 version of AROS only supports 1 CPU core. You won't find documentation for non-existent APIs. Strange, because these are all very well documented, and even if they weren't he Amiga documentations could be used, since the two are API compatible. What does announcing something has to do whether it was completed or not? AROS is developed by people as a hobby. Looking at that screenshot I can't imagine why couldn't it run on a single core. Sound card support is a different issue, you can end up with unsupported hardware. This is just like television, only you can see much further. BSzili thanks, i will try the --strip-unneeded switch, maybe it can help. it CAN work in single core mode, but this is software rendering and its optimized to run on 2 threads, it would be so soft and fluid on 2 core. lack of sound is happened with virtualbox (i did the whole process in virtualbox) and virtualbox does a regular ac97 so its strange it had no sound. this is some kernel or driver glitch because if i wanted to test the built-in music tracker software to find out if there is actually any sound, the whole kernel froze. sjees.... how hard can it be ? Yes... SMP has been there for what ? 10 years now ... it is located in trunk (64-bit) and not available for the common distributions. It is available for raspberry (again trunk) as well if not mistaken. 3. audio correctly works on supported ESS, AC97, HDAudiuo and Emu10K cards (and also on vmware). VirtualBOX is broken somewhere, but (vbox) users acceptance degree of the issue is "gneeeeh gneeeeeh VirtualBOX is good, it's your AROS problem" (experimented on my own skin). Oh and you guess is right therefor vmware runs like shite on my core2duo. Sounds works perfectly on the 4.x series of vbox. VMware player isn't able to recognize your processor's VT-extension probably because, on most default BIOS configurations, they are disabled. Please be sure your motherboard has VT-d and VT-x (or any other extension by AMD or Intel) enabled in the BIOS.